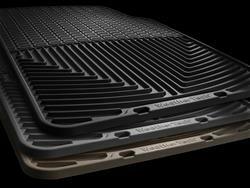 WeatherTech All-Weather floor mats have deeply sculpted channels designed to trap water, road salt, mud, and sand. They are made from an advanced rubber-like thermoplastic elastomer compound that is an OEM-approved, virtually odorless, latex-free material, that contains no harmful PVCs, cadmium, or lead and is 100 percent recyclable. All-Weather floor mats are engineered to stay flexible in even the coldest of temperatures and feature a protective, non-stick finish to make cleanup quick and easy. To prevent shifting, they include anti-skid ridges on the underside of the mat. WeatherTech mats are manufactured in America to ISO 9001 standards, and also meet FMVSS302 standards--your assurance of quality. Choose from black, tan, or gray to complement virtually any interior color; available for cars, trucks, minivans, and SUVs. All-Weather floor mats are intended to give the best possible protection for your vehicle's floor. Many WeatherTech front and rear mat applications are model specific, while others are the best possible fit for the vehicle from their many shapes and sizes. Some rear mat sizes are designed to be trimmed so that they may be customized to fit almost any vehicle.